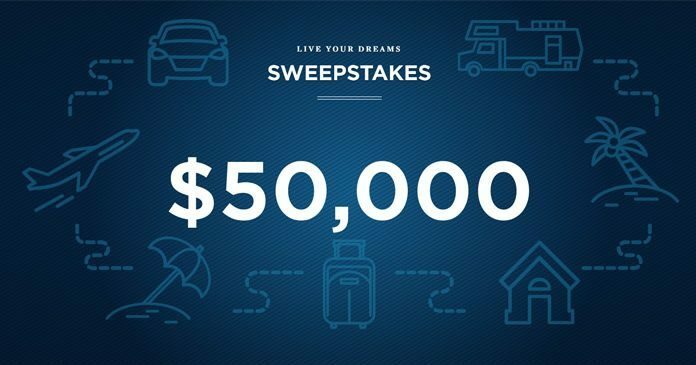 USAA Life Insurance Company wants to help you live your dreams by offering you the chance to win $50,000 during the Live Your Dreams Sweepstakes. To participate, get a life insurance quote online at www.usaa.com/lifesweeps by November 20, 2018. The USAA Live Your Dreams Sweepstakes is open to legal residents of the United States (excluding Alabama, Kentucky, Maine, North Dakota, Utah, and Washington), District of Columbia, and Puerto Rico. Entrants must be eighteen (18) years of age or older, or the age of majority in their state of residence, whichever is older, as of the date of entry. The Promotion begins midnight CT on Oct. 8, 2018 and ends 11:59:59 p.m. CT on Nov. 20, 2018. Receive one online entry into the Promotion by starting a USAA Life Insurance quote through www.usaa.com/lifesweeps during the Promotion Period. Limit one entry per person for the duration of the promotion period, regardless of method of entry. USAA Life Insurance Company will present winner with Grand Prize of $50,000 Cash in the form of a check. USAA Life Insurance Company: Service Center, 9800 Fredericksburg Road, San Antonio, TX 78288.